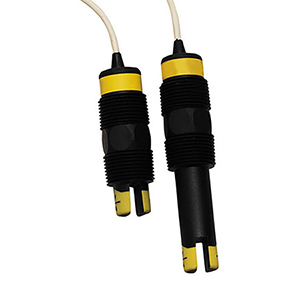 OMEGA’s ultrasonic sensors deliver accurate and reliable liquid level detection with an SPST mechanical relay output. The technology provides a high level of ultrasonic sensitivity, including resistance to vapor and turbulence. The ultrasonic sensor utilizes a fork-shaped sensor which contains two piezoelectric crystals, one of which acts as the ultrasonic transmitter, and the other as a receiver. If the air gap between the points of the fork fills with liquid, the sonic wave passes from one crystal to the other. 참고: Comes complete with operator’s manual and 3 m (10') cable. Two extended cable lengths are available: For 7.62 m (25') add suffix "-25" to model number, and add $20 for PP models, or add $75 for PFA models. For 15.24 m (50') add suffix "-50" to model number, add $40 for PP models, or add $150 for PFA models.